Teaching Math in Your Feet...Without Me! The program Math in Your Feet was developed as a five-day artist-based residency, led by me, the percussive dancer. I created the program in collaboration with Jane Cooney, an elementary math specialist in Indianapolis, IN. I hammered out the dance/math integration and dance class activities through sheer repetition, trial, and error in classroom after classroom. In 2006 I was lucky enough to also have the opportunity to develop a teacher workshop through association with the Kennedy Center and Clowes Memorial Hall at Butler University. I've been doing both student residencies and teacher workshops ever since. 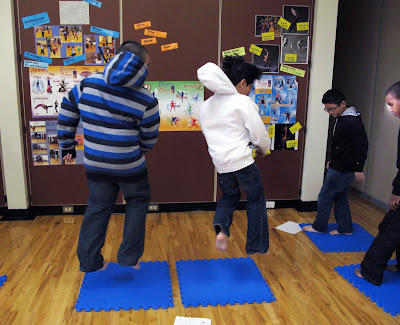 Meg Mahoney, an elementary dance specialist in Seattle, read the article I wrote about the development of Jump Patterns as a teaching tool in my program Math in Your Feet (published in the Teaching Artist Journal, April 2011). As a big fan of her work I was thrilled when she told me she was going to try it out with her own fourth and fifth grade students! Even more amazing, she has never seen the program in person or on video. True, she is a fabulous dance teacher, having worked for fifteen years in an academic setting, but still, it take a lot of guts to commit six weeks of your school year to something brand new like this. The article unwraps the dance/math residencies Malke Rosenfeld teaches in public schools. The fact that she shares her methodologies with classroom teachers for use in the classroom lit a spark for me. Even without being a step dancer myself, maybe I could lead my dance students through the jump pattern curriculum! I’m about to begin Week 5 of 6, finishing the jump patterns with my second set of 4th & 5th graders (six lessons per group), and we’re all enjoying it. Malke’s outline provided lots of material to work with, and I’ve worked the pacing & focus of instruction for each lesson to fit my ELL learners & my circumstance. The movement variables are broken into malleable chunks, and we’ve explored the math-related concepts of precision, congruency, reflection, and turn symmetry, with students choreographing patterns in teams of 2 and 3. In addition to integrating dance & math, there’s a problem-solving (choreography) component that parallels the "workshop/conferencing” structure that my students are familiar with through Writers Workshop, allowing me time to confer with & jump-start individual students. In addition, there’s a spatial arrangement that supports classroom management (personal dance spaces for each team — wow, what a concept!). Add in some dance videos to “mentor” the kids in their choreographic process & journaling questions to provide feedback on what students are learning, and it’s no wonder we’re all engaged! A perfect Math in Your Feet moment, courtesy of Meg's blog. These boys are in the middle of a 270 degree turn. Nice! I'm continuing to work away at producing the Math in Your Feet curriculum guide and instructional DVD so that any elementary classroom teacher, or PE, dance or music specialist can reproduce the same energy and engagement that an artist-based residency provides. In a way, the Math in Your Feet program is poised to be more effective in this new form because, as a teaching artist, I am just a short-term visitor who really knows very little about the individual learning needs and goals of each student, let alone the specific circumstances and culture of individual schools and districts. Based on Meg's success, and the successes of teachers who have taken my professional development workshops to learn more in-depth about the methods and content of this program, it is not hard to imagine hundreds, maybe thousands, more children jumping (and sliding, stepping, turning, hopping...) their way through math class led by their very own teachers! Sneaky Math: You Know, UNO! My six-year-old daughter is hip to my game. You know, that I'm interested in stretching and deepening my personal understanding of what math is and how we make it. She has become highly sensitive to moments where I might be trying to teach or show her something math related. She's on to me. She calls me, accusingly, "Math Mommy!" Now, however, she wants nothing to do with me and my math. And, after being quite self-motivated and curious about measuring, comparing amounts, comparing sizes, spontaneous chant counting by tens and twos, relationships between numbers, and relationships between shapes the whole summer and fall, her inquiry into all these things has slowed somewhat. Except, she has become a W-H-I-Z at two person UNO. We are UNO addicts; we play UNO every day, sometimes twice a day. UNO perks us up: Having a bad day? Let's play UNO! Been in the same argument loop all morning? Let's play UNO! And, yes, I know there is math in this game but DON'T TELL HER!!! Honestly, I have been giddy with glee that I now have an outlet to influence her mathematical thinking and move her math skills forward without her knowing! Well, I mean, she knows she's adding up points, for example, but she wouldn't do it at all if I just asked her to outright. She's already shot down my suggestion that maybe, perhaps, we could, let's say put down a 3 and 4 to match that yellow 7 that's on top of the pile? "Math Mommy! I just want to play the game!" So, I've come up with my new 'sneaky math' approach. ﻿﻿﻿﻿﻿﻿﻿﻿What she doesn't know is that, faced with such perceptive resistance, I'm loosing on purpose (sometimes) and I'm quite gleeful about the way that it's working out. I hand her my handful of lost points and say, "How big a win was it for you?!" giving her an opportunity to be very specific about the magnitude of her victory. I'll casually say, "How many tens can you find?" or "What's fifty plus twenty [Wild Draw Four + Skip cards]?" As a result she's naturally skip counting by tens and sometimes fives, easily finding different combinations of numbers to make ten, adding numbers to sums way past twenty, using her fingers less and less and, in the process, improving her capacity for mental arithmetic. ﻿She is quite publicly gleeful herself as she gloats about the magnitude of her victories. Me? I am secretly thrilled that I've found a way for my incredibly enthusiastic and fiercely independent learner, enigma that she is, to enjoy her math without knowing her mama is enjoying (and influencing) that math along with her. For Christmas, since the kid is so into games these days, she's getting Junior Monopoly and the cube version of Quirkle. Oh, and Mancala, plus some really cool fractal fridge magnets to go with our fridge tangrams. I've got my sneak on, big time! The fabulous Nic Gareiss and the rest of This is How We Fly. Feet visuals at around one minute in. Enjoy! I took my daughter to the Nutcracker Ballet this afternoon at Indiana University. We had a great vantage point from up in the balcony, perfect for a six year old actually. We could see the entire audience and into the orchestra pit, usually hidden from view. We had a great view of the stage. And, it was the perfect place to take in the big picture of moving bodies in space. Personally, I enjoyed the corps de ballet pieces the best. I'm usually very sensitive to timing and phrasing, but every group piece was so well performed that I was just able to relax and take in the moment. I had a thought, while watching, about how the lines and movement through space (both in the bodies and around the stage) were made more understandable, and beautiful, because of the amplification of the patterns. By this I mean, sixteen dancers on stage dancing the same choreography highlighted the patterns and rhythms in a way that a solos or a pas de deux does not. I also thought about how the real meaning to be found in patterns is in the change and movement between one moment and the next. We often think of patterns as fixed moments in time, but even visual artists know that without a sense of movement on the paper, the patterns lose meaning. At this point in my inquiry into such topics I know enough to say confidently that math, science, social sciences, history, literature, and arts of all kinds ALL assign some value to what happens between Point A and Point B. That is what we do in Math in Your Feet. We move from Point A to Point B. We figure out how we're going to get there, and which way we're going to turn. We connect the four individual pieces of time to make a larger whole and once we've got the flow of that, we then find a way to connect our patterns together -- where does one end and the other begin? These are the questions of mathematicians and scientists and artists and philosophers as expressed through the mind and body of a typical fourth grader. As we sloshed home through dark late afternoon rain I suddenly remembered seeing a video almost a year ago of micro-origami unfolding in water; they have a very fractal-like quality. I recently watched Between the Folds, a documentary about origami, and was moved to tears at the depth of meaning inherent in the process of folding. Since we think of origami as a fixed and finished object we often don't observe or think about what happens between a flat, uncut square and the final 3D object. This video of micro-origami, below, will show you, in reverse, the movement, order, folds and structure used to create each piece. The original silent video of Etienne Cliquet's Flottille (2011) is here but I chose this (shorter) video that was presented with music, to share with you. Enjoy!